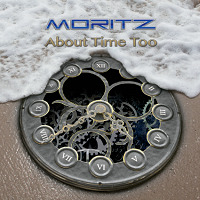 AOR/Hard Rock act MORITZ formed in 1986 in London, U.K., with the mission of making quality AOR Rock Music. They released an EP titled “Shadows of a Dream” but despite a lot of buzz at that time were not able to secure a major record label, and, ultimately, broke up in 1988. The band re-formed in 2009 and have since released two full-length albums, to critical acclaim. “About Time Too” is presented here as their third, which contains eleven tracks. I always cringe just a bit when a band that has been out of the game this long reforms in the spirit of their original charge. A lot of time has passed and although that nostalgic sound is welcomed by my fellow older rockers at times, you wonder if they have anything new to bring to us. Let’s get to some of the highlights on the album to hear for ourselves. “Moon and Back” puts its hooks into you pretty quickly from the start. The airy and melodious sound comes from the soulful rasp of Scallan’s vocals and a chorus of backing vocals that sell the harmony. The guitar riffs are easy to assimilate and the overall sound is update and positive. “Dreamland” is another strong with those emotional leanings we often hear in good AOR music. The ability to connect them with the listener is really what makes the music so good. There is a stirring mid-tempo sound and honest lyrics that I can see lighters going up to salute if this were being performed live. A legato guitar solo adds some more depth to the melody line. “Forever Is” is more of a ballad of sorts, the kind that you always want with good Rock/AOR. Acoustic guitar and a strong vocal performance are the key to this song’s impact. “Run” has lush melody lines with a mid-tempo pace and a bit of a darker sound that comes from a longing lyrical message. I have to commend the lead breaks which up until this point have been stellar. You don’t need a flurry of notes to get across the message and help the melody to shine. “Love Long Gone” works in some nice harmonies in both the verses and the choruses and challenges the upper range of Scallan’s vocals which are met head on. “Own Little World” is a sweet song with emotional peaks from some great vocal harmonies that you just want to go on forever. “You Don’t Know What Love Is” is the first track where the keyboards have a hand in the melody. I always like it when a band shows love for keys and don’t understand why some Rock and Metal fans don’t feel like they should be a part of a band’s sound. For me they are every bit as important as the guitars in Rock based music. Did they save the best track for last? “There’s Something About – Unwanted Man” has a long build in that reminds me of something STEVE WINWOOD might have done in his songwriting craft. I have always felt he was an underrated songwriter and this song hits the mark for me for sure. Again, the keyboard notes shine in a heavier track where the bass and drums thud away on the bottom end with swagger. I have to say I was pleasantly surprised that the album was as good as it was. It isn’t a sound that you haven’t heard before, but it does sound like they were able to pick up where they left off years ago with success in the mission to make quality AOR/Rock Music. There is a good deal of soul that you can gleen from the album with songs that make you feel good. In the end, isn’t this what music is all about in the first place?